This 30 year old woman presented a year after a steroid injection (to treat allergies) into her arm. A discrete, deep hole had developed and remained on her arm (left). After fat injections to her defect, she had not only a normal contour, but also the skin of the injected area lightened from a grey blue to a healthy pink normal color. She returned at one year (right) pleased with the correction. We are only beginning to discover and understand the potential uses of fat for healing. Over the years, Dr. Coleman has observed that autologous fat placed into areas where there were notable scars, burns, or sun and radiation damage that the appearance of the skin seemed to improve over time. In fact, he noted that the skin continued to improve over years. Many patients who had had red, rough, thin skin in irradiated areas were seen to have thicker, softer, less red, healthier-appearing skin months and years after fat grafting. Pain in these areas was often reduced or eliminated. Acne scarring, scars from chicken pox, injury or burns was improved by fat grafting in the affected area. As Dr. Coleman discussed in his paper published in the September, 2006 issue of the Journal of Plastic & Reconstructive Surgery, grafted fat affects the tissue into which it is placed in many ways for the duration of a patient’s life. It can improve the quality of aged and scarred skin, heal radiation damage, and treat chronic ulcers. Much research is being undertaken to understand how fat does what it does, and how we can use it in other beneficial ways. At least in part, fat heals damaged or scarred skin because fat tissue has the highest concentration in the body of adult stem “repair” cells. These special cells may be working by helping to create a new blood supply in the tissue, thus providing oxygen and nutrients. There is now evidence that fat grafted using the Coleman method can prevent and even reverse the body’s natural pathways that create and maintain scarring, both in the skin and deeper tissues. Additionally, fat tissue can also release growth factors and hormones, affecting tissues in many other ways. The benefits of the use of fat over temporary fillers to treat scarring is obvious: fat has every indication of being permanent; there is no risk of rejection or “allergic” reaction; the improvement appears to continue over time, rather than regress, as with temporary fillers; and, for most of us, it is in abundant supply! For more information about LipoStructure procedure, please click here. For more information about your initial consultations, please click here. To visit our FAQ page, please click here. 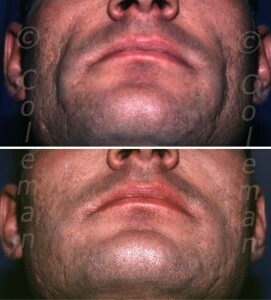 This 27-year-old man presented with a history of severe acne since he was a teenager, leaving him with multiple scars with deep depressions in his cheeks. He returned two years after one fat grafting treatment with release of adhesions with a special “pickle-fork” device. Not only had his scars and depressions improved, but he also felt that his beard appeared to be growing in more normally.